Daniel Centeno had little idea what to expect when he rode Alwaysmining for the first time on Oct. 27 in a 1-mile allowance/optional claiming event for 2-year-olds over a sloppy Laurel Park surface. Centeno keeps saying yes, Rubley keeps honing Alwaysmining to a razor's edge and Centeno does his part, flying to Maryland on Saturday for the fourth time since the Tampa Bay Downs season started and riding the 3-year-old gelding to a fifth consecutive victory – the last four in stakes races – at Laurel in the $100,000 Private Terms Stakes. Each of the victories has come at Laurel. Alwaysmining led every step of the way in the Private Terms, touring the mile-and-a-sixteenth in 1:42.65 while winning by six-and-three-quarter lengths from Joevia. It was Alwaysmining's first race around two turns and couldn't have gone any better, Centeno said. “I thought he could get the distance easily, but we didn't know he was going to win like that,” Centeno said. “I hit him one time at the 3/16-mile pole and then I let him do everything on his own, and he finished strong and galloped out really good. Alwaysmining, who is owned by Runnymede Racing, is a son of 2011 Travers winner Stay Thirsty out of What will Be, by Anees. The logical next start for Alwaysmining would come in the $125,000 Federico Tesio Stakes at a distance of a mile-and-an-eighth on April 20 at Laurel. The Federico Tesio is a “Win and In” race for the Preakness Stakes, the second leg of the Triple Crown, on May 18 at Pimlico. “I know the owners and Kelly are going to talk about what's next, but no matter where he goes, I'm going to ride him and we'll see what happens,” Centeno said. 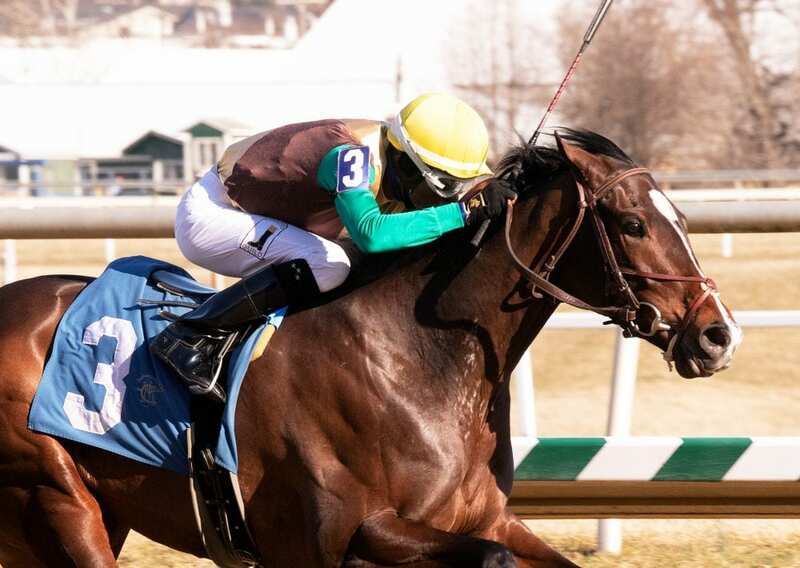 This entry was posted in Triple Crown and tagged alwaysmining, daniel centeno, Federico Tesio, kelly rubley, laurel, laurel park, preakness, Preakness Stakes, private terms stakes, tampa bay downs jockeys, Triple Crown by Press Release. Bookmark the permalink.